Something’s rotten in the heart of apple country! Hildy Biddle dreams of being a journalist. A reporter for her high school newspaper, The Core, she’s just waiting for a chance to prove herself. Not content to just cover school issues, Hildy’s drawn to the town’s big story–the haunted old Ludlow house. On the surface, Banesville, USA, seems like such a happy place, but lately, eerie happenings and ghostly sightings are making Hildy take a deeper look. Her efforts to find out who is really haunting Banesville isn’t making her popular, and she starts wondering if she’s cut out to be a journalist after all. But she refuses to give up, because, hopefully, the truth will set a few ghosts free. 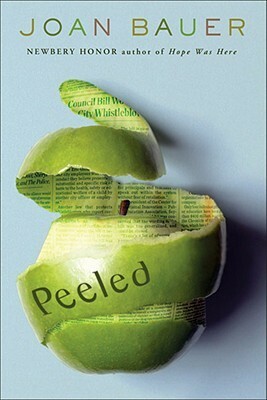 Peeled is classic Joan Bauer, featuring a strong heroine, and filled with her trademark witty dialogue, and problems and people worth standing up to. The book was a good overall concept, but there were just WAY too many characters that were mentioned in all parts of the book. I’d say there were close to 15 supporting characters, that were possibly supposed to be just background characters but they just had too big a role to just be cast off as a background. It was incredibly confusing at points to figure out who was who. The writing itself was alright, nothing fancy. I wasn’t impressed at all, and was expecting more from an author who won a Newbery Honor. I’d recommend it but it’s a slow read, simply because you have to keep going back and double checking who is being talked about.